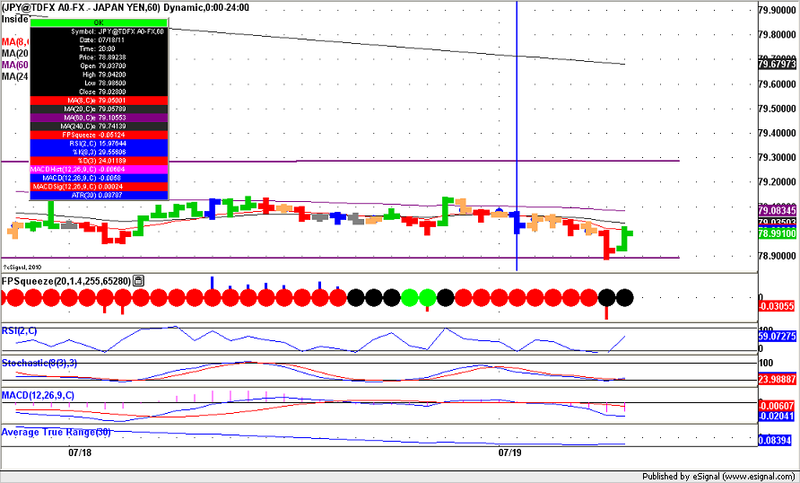 Today was a good day for Opening Range Breakout trading on USD.JPY off the London open. Note the vertical blue line on the USD.JPY 60 minute chart below. This point marks the unofficial ‘London Open’, 6 AM London time. Price action moves away from the open as traders place bets on which way they believe the market will unfold for the day. This initial move is important, agile traders can profit using ‘Opening Range Breakout’ strategies. Note the 60 minute ‘Inside Bar‘ immediately preceding the ‘open’ (vertical blue line). This bar has a range of just 2.5 pips. One way to play the opening breakout is to ‘bracket’ the inside bar: buy on a stop if price breaks the high of the inside bar, sell on a stop if price breaks the low of the inside bar, protective stop on the other side of the inside bar. Exit is either a loss on the other side of the bar for 2.5 pips (minus commission & slippage), or scale out using profit targets. Scaling out cuts risk and locks in profit. There are many ways to scale out of trades, one of the best is to exit 1/2 the position once one unit of risk has been gained. At that point the remaining trade is ‘risk free’, if you are stopped out you are flat minus slippage / commission. Using the above example, 1/2 the position is exited for a gain of 2.5 pips. Thereafter more units can be scaled out down to a final unit where stops can be moved to ‘break even’ for a risk free trade. The maximum favourable excursion (MFE) on this trade is currently 16 pips from an initial 2.5 pips risk, a 6 R multiple! If you enjoyed reading this update on Opening Range breakout, visit our Forex Strategy Pages now for more Trading Insights.